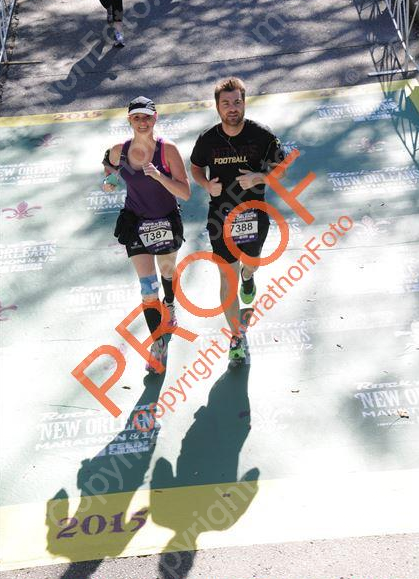 On Sunday, I completed my 11th 13.1 - the Rock n Roll New Orleans Half Marathon. I am here to tell you that no matter how many half marathons or marathons you do, they do not always become easier. 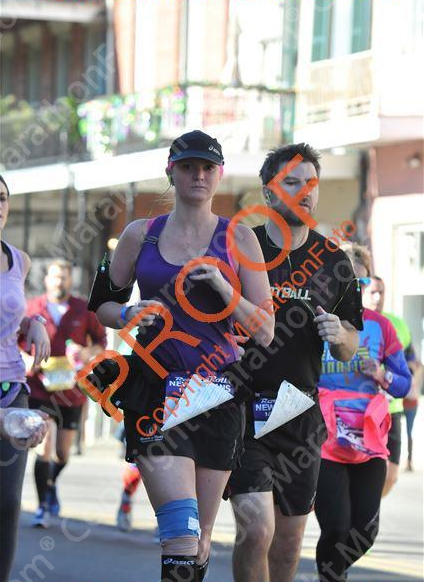 This was a rough one for me physically but thanks to beautiful sights on course, I pushed through it. The Rock n Roll races start at 7:30, much different than the 2:30am wake-up call at runDisney. Gabe and I set our alarm clocks for 6:30, snoozed until 7:00, changed - grabbed coffee from across the street and leisurely made our way to the start line. We were in corral 7 and waited for our turn. I knew going in that this would be a tough 13.1 miles. Gabe was under trained and I was coming off of cruise sickness (or a severe hangover which lasted 4 days - your call). Mile 1-3 was my roughest start of any race. It was cold and windy. I was having a very hard time breathing and felt like I was having an asthma attack. 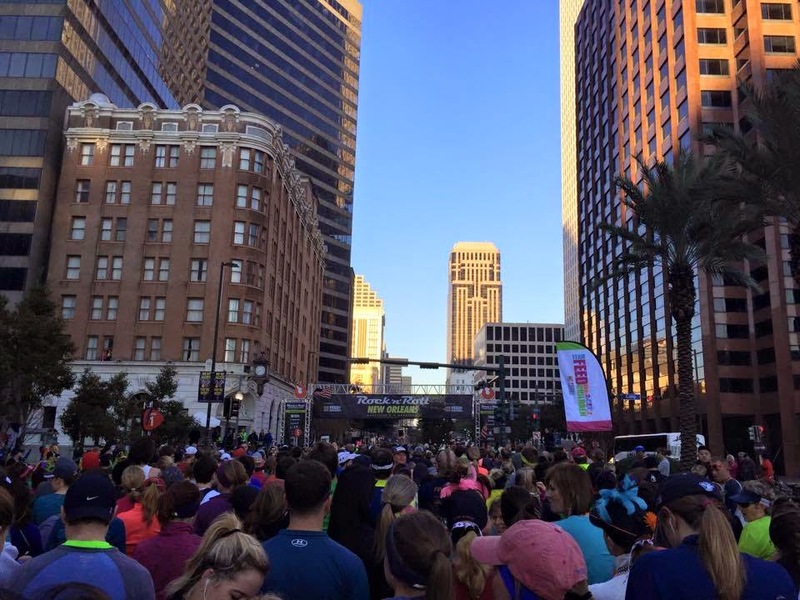 I knew the Rock n Roll New Orleans course and was looking forward to getting into the Garden District, so I could mentally trick myself into thinking I was doing a running tour with 7,700 friends. It was a gorgeous day and I made sure we took some photos of the beautiful surroundings. In the garden district, I saw my favorite sign to date. Just head over to my Rock n Blog profile if you want to see why I love this sign so much. I don't know you girlie but we could be besties! When we made it to the turn around at mile 4.5 outside of Audobon Park, I was feeling great with a huge smile on my face. We were running through our favorite city in the US and couldn't wait to be done so I could eat everything in sight. 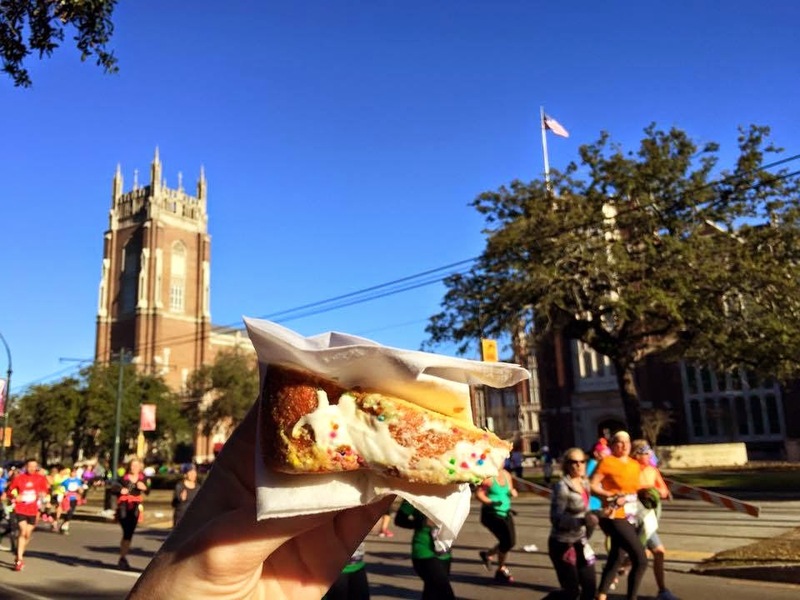 Speaking of food, people were handing out King Cake to the runners! Gabe and I were just discussing King Cake with our friends Heather and Bobby the night before. I think this will be my first and last bite of the sugary madness. Right after mile 5 is when all hell broke loose. The pavement in the Garden District is pretty bad. I am used to this running in poor street conditions in Ybor City but this was worse than I recall....uneven, broken and pot holes everywhere. When my right foot struck the pavement, I heard my knee pop and felt a sharp pain through my entire leg. For the record, this is the same leg that I have ankle issues with. I screamed out and knew something wasn't right. However, I pushed on, slowing us down to a much slower pace. Prior to this, we had a 10:30 pace on a 2/1 run walk. I cried the entire time from mile 5-7. At one point, I almost fell because I couldn't put any pressure on my knee. I thought we were going to have our first DNF. I didn't wear a water belt and I desperately wanted to take my tylenol. 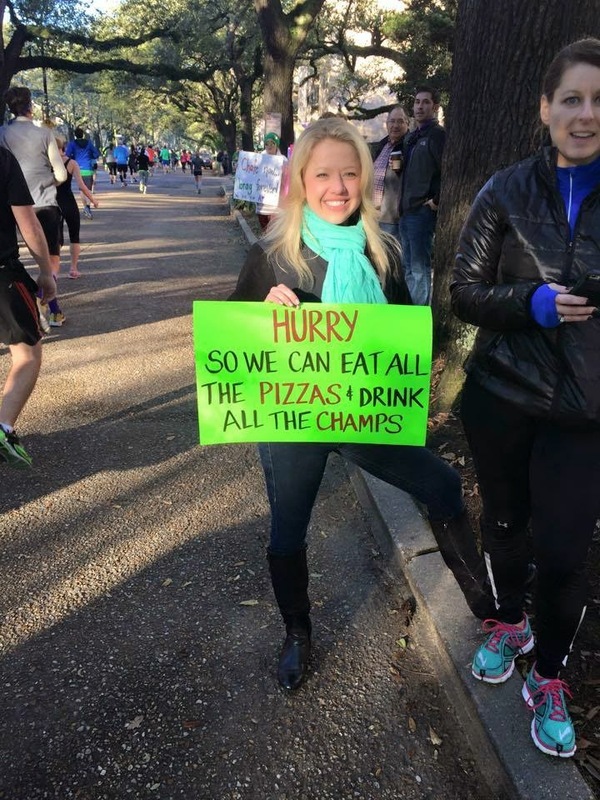 If only this had happened a few minutes prior, I could have grabbed water at mile 5. We finally made it to the medic tent and got my knee wrapped. So I took random photos and cried a little more. The knee wrapping helped significantly, as I know without the wrap, I would have never finished. However, I was miserable - photo above is proof of that. If looks could kill.....MEAN RUNNER! 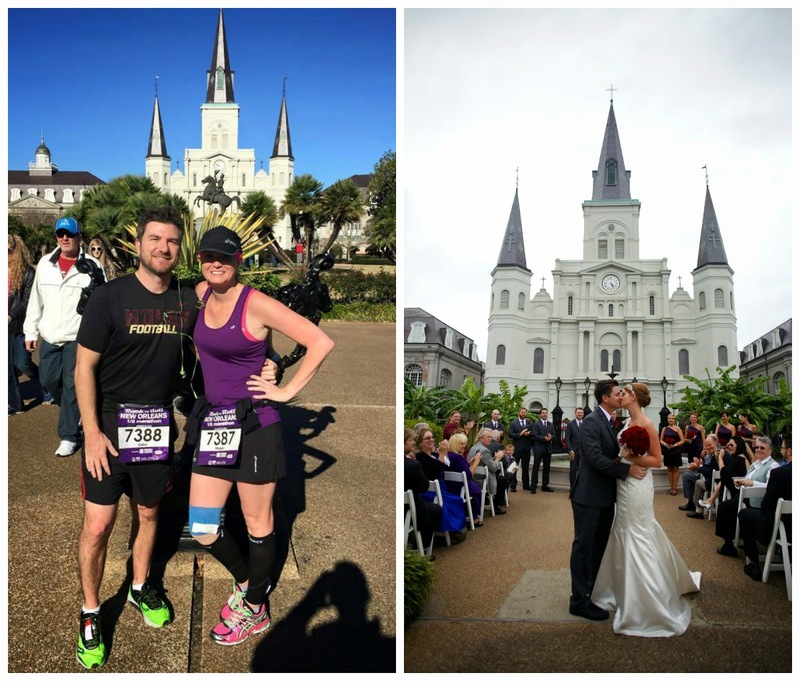 Between miles 9-10, we found ourselves at Jackson Square, where we got married 4 months prior. This is when things got better for me since we were at our happy place. I knew we only had a little more than a 5K to go. I mentally broke down those 3 miles down and related them to the course we run at home . I knew we could finish, even with the pain I was going through. Hard to believe that 2 weeks prior, I finished my 4th full marathon with no pain and here I was mentally tricking myself to finish a half. Once we got onto Esplanade, I knew it was a straight shoot to City Park. 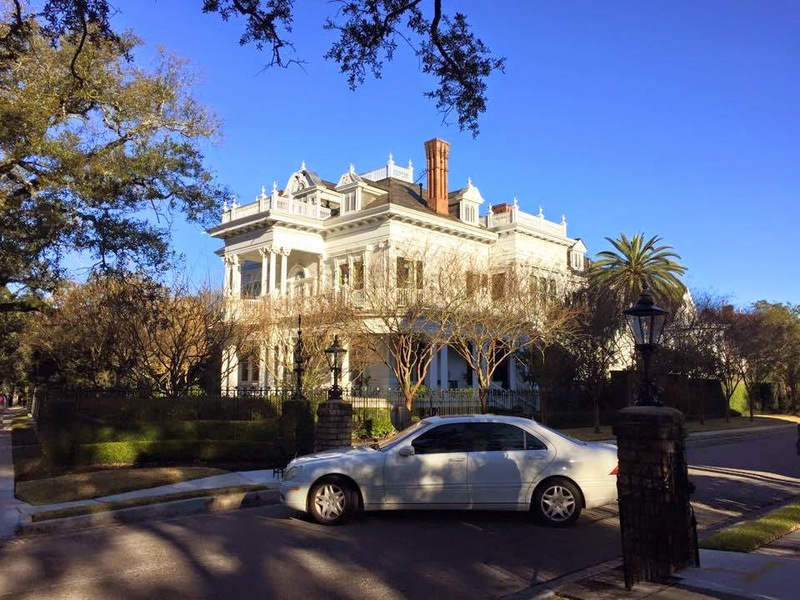 We rented a house off of Esplanade a few years ago when we came up for cake tasting and other wedding related duties. 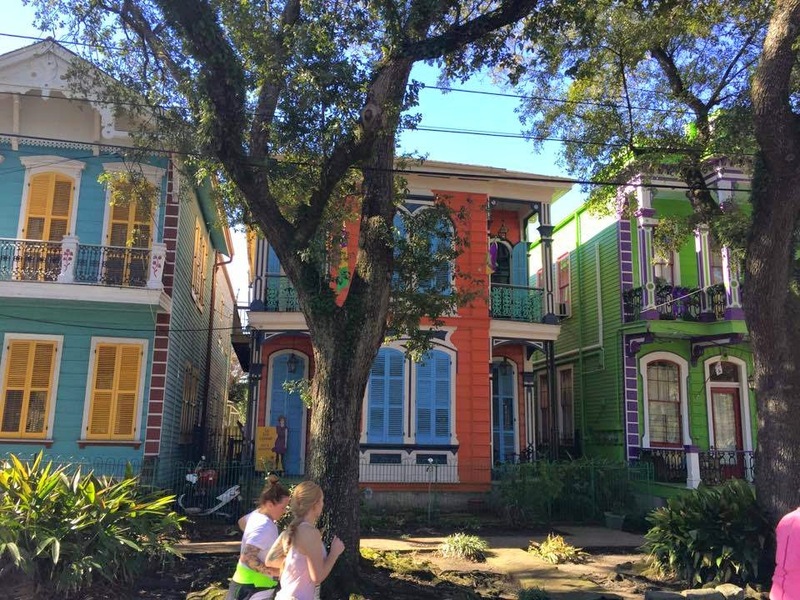 This area is where Frenchman Street is, one of our favorite hangouts in NOLA. 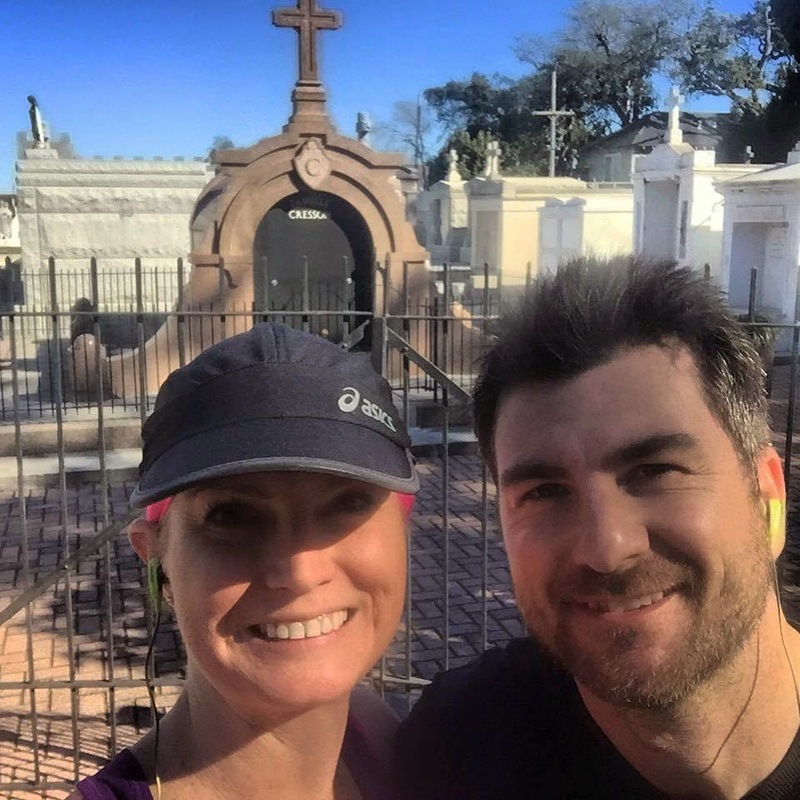 Right before we got into City Park, we passed St. Louis Cemetery #3 and I had to get a photo. It clearly defined how I felt at that point in time. Then finally, we made it to the finish line with a smile on our faces. If it weren't for my knee, this race would have been amazing. It was not our best finish but wasn't our worst finish either. We pushed on and my husband was there to support my 1,000 hissy fits on the course. 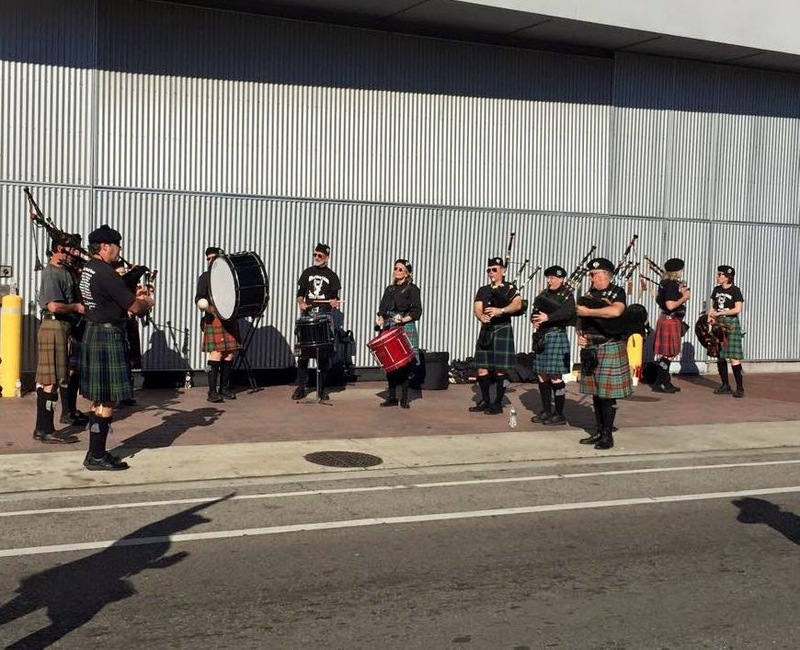 I love the Rock n Roll series and look forward to running many more events in 2015 with them. Our next race up is Rock n Roll DC on March 14th. Knee update: My knee is still tender and bothers me a little throughout the day but I do not feel it is severe enough to see a Dr. I have had knee issues since my teenage years, thanks to playing Catcher in Softball for over 10 years #kneeabuse. I am going to take off a week from running and do a few short runs next week. If it bothers me then, I will make a Dr. Appt. Keep your fingers crossed! 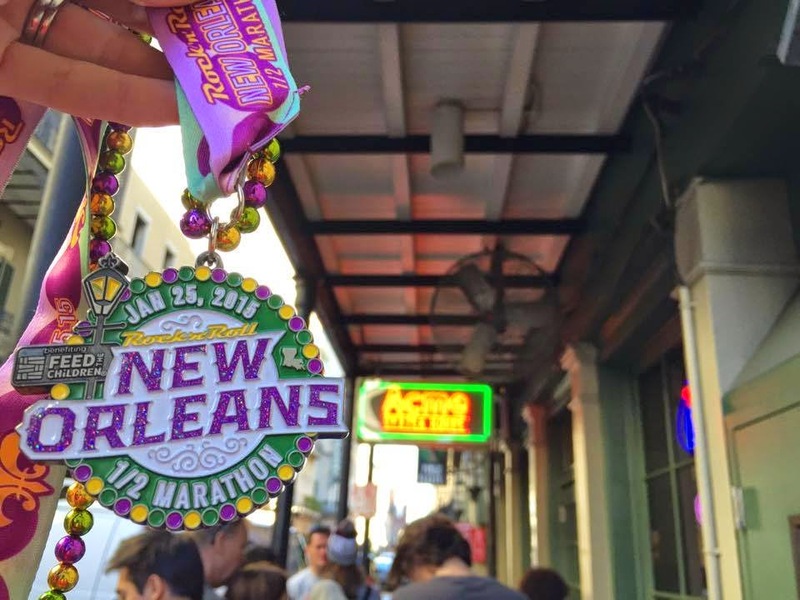 I would love to run New Orleans! The medal is so cool. Sorry about your knee but good for you for pushing through anyways. haha mean runner! I think Bobby is still mad at me for yelling at that girl. So glad we got to hang out with yall!